Before you begin, ask if it is really necessary to do an alignment. Replacing the wax capacitors and the electrolytic cap in AA5 radios will not change the alignment, and you need not do an alignment. Only if you need to repair or replace one of the IF transformers or antenna or local oscillator circuits will an alignment be needed. Changing tubes with the same type replacement shouldn't change things enough to require an alignment. If you do not have a signal generator, it is possible to use the local and distant AM radio stations of your town as signal generators. Let the radio warm up for at least 20 minutes (resting inside the cabinet if possible) before you start an alignment. Things should be at their normal operating temperatures by then. A high impedance voltmeter looking at the AVC line will indicate signal strength as you tweak adjustments. Mainly useful with local stations and when looking for a subtle peak. Many AA5 radios have non-adjustable inductances for the local oscillator coil (T1 in the above diagram) or the antenna (L in the above diagram). It appears that making such coils accurate wasn't that hard to do in production, and it was cheaper than making them adjustable. The tuning cap almost always has trimmer adjustment caps, these have maximum effect on the high end of the AM radio band. Almost no effect on the low end of the band. As the inductances and capacitances of the antenna and local oscillator tank circuits are essentially fixed, a way to get maximum sensitivity out of the radio is to set the frequency of the IF transformers to the difference of the peak resonsances of the antenna and local oscillator tank circuits. Tune in a relatively weak station around 600KHz (a station you know belongs there, you heard identify itself by callsign), and try tweaking the IF transformer trimmers or slugs. ***You MUST use the exact fitting tool, or else you WILL break the slug and it will get stuck. These slugs are FRAGILE*** You should be able to "walk" the tuning dial up or down slightly to see which way gets more signal. You should hit a maximum. You shouldn't have to go very far, no more than 20KHz or so. Finish the IF by tweaking the secondary of T3, the primary of T3, secondary of T2, and the primary of T2 (see diagram). Then retweak in the reverse order. Hopefully, the station will be located at about the right spot on the calibrations of the dial. Reposition the pointer if you can (slide rule dials). Or just remember the amount of offset to apply to the dial and reposition the pointer later. See down below on how to check the frequency of the IF stages. Now for the high end of the band. Tune in a weak station at the top of the dial, and check to see if the station is located at the right spot on the calibrations of the dial (with the above offset if needed). Tweak the local osc trimmer cap to walk the station to the right spot. Tweak the antenna trimmer for max signal. Then tune in a weak station around 1400KHz and retweak the antenna trimmer for max sensitivity. This should finish the job. If the local oscillator coil is adjustable, and if the radio uses a ferrite rod (you can slide the coil of wire along the rod to adjust its inductance), you should first be sure the IF is at the right frequency. Also even if these coils are not adjustable, it is still best to tune up the IF to the correct frequency, usually 455KHz. One way to do this is to use a known good radio's IF as a signal source. 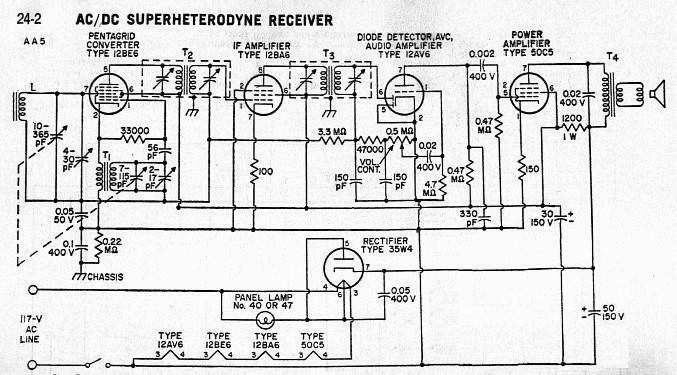 This source radio can be a modern solid state one, especially if it has a ceramic resonator at 455KHz. A way to verify the "known good" radio's IF frequency is to get a third radio and use it to "sniff" the "known good" radio's local oscillator circuit leakage. Place the radios next to each other. Tune the "known good" radio to a station near 610KHz. The other radio should be able to pick up a continous unmodulated carrier at near 1065KHz. The FCC doesn't assign stations with a separation of exactly 450 or 460KHz in the same town so your neighbor's radio won't jam your reception of a local station. depending on the accuracy of the other radio's dial calibration, or if a distant station of known frequency is being jammed, you can take the difference of this and the station tuned on the "known good" radio. This should be 455KHz within an error of 10KHz. If so, then this verifies the "known good" radio's IF frequency. You can also use this process to determine where the IF frequency is of the radio under repair. If it's off by more than 20KHz, proceed on. Using independent isolation transformers on the radio under repair and on the known good radio, lightly couple the output of the known good radio's IF output stage to the RF input of the radio under repair's converter tube. Do this by tapping with a clip lead to the known good radio's diode detector anode (plate) and intertwine loosely another insulated clip lead (but not directly connected, you just want a few picofarads of capacitance). This second clip lead connects to the RF input of the converter tube of the set under repair. You need not worry about connecting the grounds. Tune the known good radio to a moderately strong local station. You should be able to tune up the IF circuits of the radio under repair now. Reduce the amount of clip lead coupling to reduce signal strength if it's too much. Practice on a radio you don't much care about first.